If a fortune teller told me: “I see a large blue mat surrounded by excited children,” I’d have guessed she was describing one of my chaotic PE lessons. 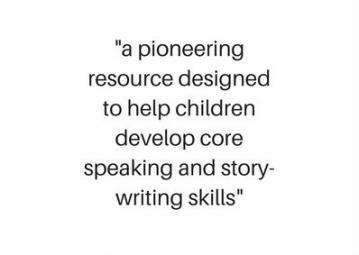 But what my future actually holds in store is an impressive new classroom must-have called Mighty Writer, a pioneering resource designed to help children develop core speaking and story-writing skills. Mighty Writer centres on a mat, which acts as a huge visual aid for building sentences and stories. You and the children are gathered around it on the floor, meaning interactions are far more personal, natural and dynamic. Decisions and choices can be made collaboratively and it focuses attention on the teaching and learning of composition. 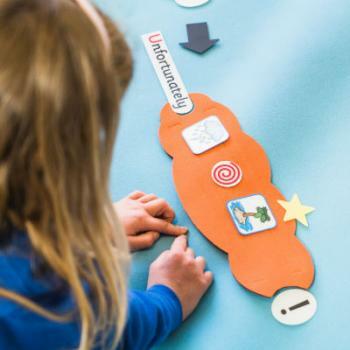 The mat enables children to create or recount their own stories, using the mat as a canvas and a number of detachable toolbars (good-old Velcro) that contain punctuation, sentence openers, conjunctions and themed images linked to a variety of topics to kickstart children’s imaginations. A standard Mighty Writer set contains illustrations of various locations, living things, objects and environments, and more themes can be bought separately. 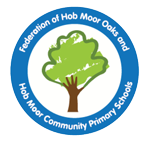 Image toolbars include Real Life, Fantasy, Space, Three Little Pigs, Goldilocks, Little Red Hen and Jack and the Beanstalk. There are also hanging mobiles of the symbols available too. 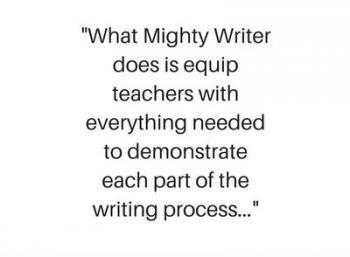 What Mighty Writer does is equip teachers with everything needed to demonstrate each part of the writing process. 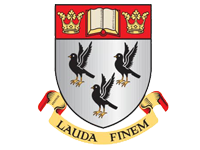 You can therefore direct and control the type and number of images within a toolbar, as well as things like the amount of sentence openers to be included, and then model the writing process. 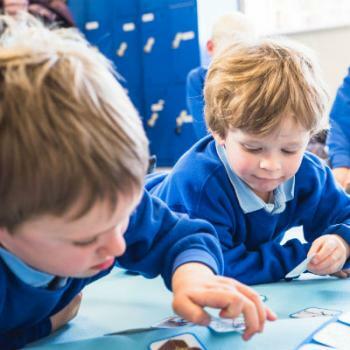 Children aren’t passive observers either, they can place images, words and punctuation, and rich discussions can take place based on their choices. The beauty of this resource is that children can see how the component parts of a sentence join together, how they can be changed and what options they have. 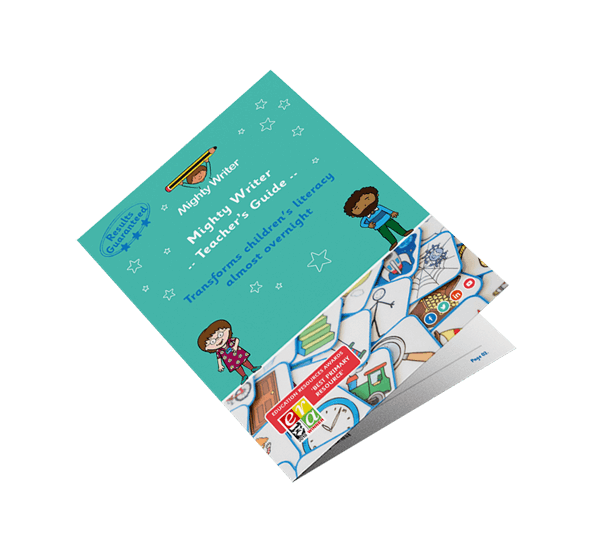 Help is also at hand on the Mighty Writers website, where you’ll find the Teacher Zone containing two instruction guides, a curriculum reference sheet, 14 training videos and 22 Mighty Writer plans. Plus, there are nine lesson plans, including modelling a story, creating a beginning, creating a sentence and using a feely bag. The plans are no more than a couple of pages and focus on what you need to know, with ideas for shared work, group and individual tasks and extension activities. 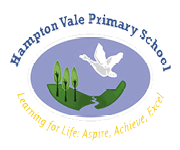 Experiences can be shared via a teacher’s forum too. Mighty Writer works on so many levels. For starters it is a tactile resource so children are in there, part of it, using it. 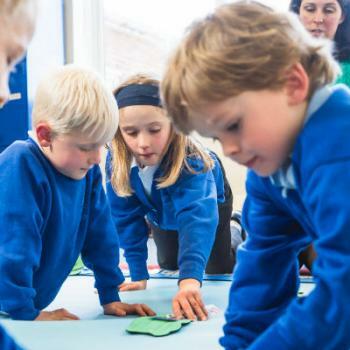 But it’s also engaging because it is colourful and this invites children in to splash around and make waves in their speaking and writing. This is also a very easy resource to set up and use, so it can slip into other lessons and complement other techniques and strategies. It lets children see first-hand how you write, what decisions you make with word choice and content, and it makes the writing process less intimidating. 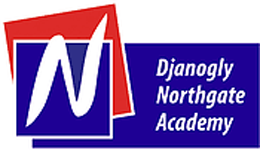 The focus is more on quality than on quantity, and it’s definitely a resource that will enable and support children of all abilities to become independent, self-assured and accomplished writers of both fiction and non-fiction. 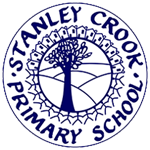 What’s reassuring is that Mighty Writer has been very successful across a number of schools. Feedback has detailed accelerated improvement in writing sentences, use of punctuation and children being more confident in crafting stories. 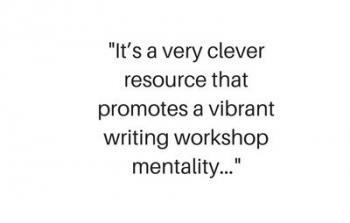 It’s a very clever resource that promotes a vibrant writing workshop mentality. 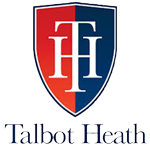 This is a very well-equipped and top-quality resource that you will use for years and years to come, works out as excellent value when you think long-term. While the standard of writing in schools has improved in recent years it still lags 20 per cent behind reading at all key stages. Why is this? Perhaps it’s because we focus far too much on the end-product, rather than the process, of writing. 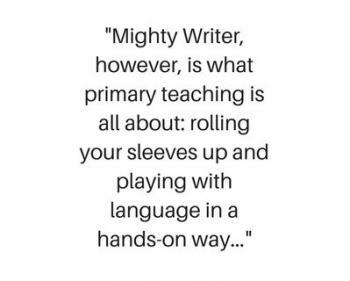 Mighty Writer, however, is what primary teaching is all about: rolling your sleeves up and playing with language in a hands-on way, and letting children experience the different textures of words. It’s a resource to explore and discover, where they can have more of an authentic connection with words in order to build stories.